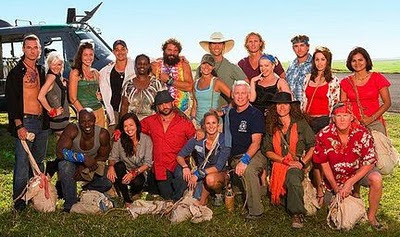 I am loving Survivor this season. I have to admit though, I am all for the villains. Probably because other than James, I don't really like any of the heroes this year. I used to like Rupert but he's just being worthless this year and Tom and Colby are being all arrogant, as usual. Now the villains, they're the exciting bunch. You've got grouchy Randy, my favorite Coach Ben Wade, Boston Rob, Russell and a host of other people I adore like Courtney. What more could you want? Not to mention the fact that the villains actually seem to work together on the challenges and win. The heroes seem to have too many chefs in the kitchen. I forgot, I do like J.T. on the heroes side but no one even listened to him when it was time to do a challenge he'd done in the past. At this point I can't even imagine who might win but I'm certainly hoping it's a villain. One thing is certain, I am loving Thursday nights!